Rolando Villazón singing a disc of Handel arias? On paper, the idea seemed ridiculous, to me anyway. The Mexican tenor has had enormous international success in recent years, but it's all been in Romantic, nineteenth-century repertoire: Verdi, Puccini, Massenet, Gounod, even Tchaikovsky. According to the liner notes for his new disc, though, it all changed when he recorded a CD of Monteverdi with Emmanuelle Haïm, who gave him the confidence to explore earlier music. Villazón's detractors might even say that it's safer for him to stick to less heavy repertoire, following his vocal crisis a couple of years ago, but that's not really the point here: this new disc shows that the match of composer to performer is surprisingly felicitous. The tenor is always a talented recording artist, one who understands how to shade the performance in just the right way to fit the microphone's sensitivity to detail, so music that places nearly all the emphasis on the voice, with very light accompaniment, is actually very well suited to him. Of course, the purists won't be happy that Villazón's chosen to sing mezzo-soprano arias on the disc when there's a wealth of material written for the tenor. The arias from Ariodante and Serse are celebrated mezzo showpieces, and those who have any of the widely-available recordings of these arias sung by mezzos in their ears may well find it slightly bizarre to hear them done by a tenor. But as Paul McCreesh – the exceptional conductor of the set – explains in the liner notes, Handel sometimes transposed mezzo arias for the tenor. And when the line of the mezzo numbers fits Villazón's vocal brilliance better than some of the tenor arias available to him, why not perform them? The impressive thing about the performances on the disc is the way in which Villazón collaborates so well with the period instrument ensemble, the Gabrieli Players. There is no incongruity of approach between the two. That's partly because McCreesh favours expressivity of a kind that is not unlike the verismo-period style in which Villazón is used to singing, but one shouldn't deny the tenor the credit for adapting himself so well to the music. The disc starts well with Bajazet's aria 'Ciel e terra armi di sdegno' from Tamerlano, an aria communicating pride and complacency, both of which qualities Villazón brings out in his performance. The coloratura is confidently threaded through, but the noteworthy aspect both here and elsewhere is the level of detail in the dynamics and articulation. This continues in Grimoaldo's anguished accompagnato,'Fatto inferno è il mio petto', and particularly in the aria, 'Pastorello d'un povero armento', where the long lines are broken up by lots of localised nuance such as in the line 'sotto l'ombra d'un faggio o d'alloro'. Serse's four numbers are similarly absorbing, from the intensity of the accompagnato 'Frondi tenere e belle' to the famous aria 'Ombra mai fu', which Villazón gives an admirably contained performance, eschewing the overblown approach of other Romantic tenors who've tried it in the past. The leaping violin lines and trills of the introduction to 'Più che penso alle fiamme del core' seem to inspire Villazón to respond with a similarly frothy performance, observing the double-dotted rhythms and dashing off confident, bravura cadenzas. The coloratura in 'Crude furie degl'orridi abissi' is also surprisingly secure, while Villazón also inhabits the vigour of the aria's mood. Of the two Ariodante arias, perhaps the poise of 'Scherza, infida, in grembo al drudo!' comes over the best, though again Villazón rises to the challenge in the drawn-out fioritura passages of 'Dopo notte atra e funesta'. By any standards, Bazajet's death scene is ideally matched to Villazón's talents, and the appearance of Rebecca Bottone (Asteria) and Jean Gadoullet (Tamerlano) is something of a luxury. Here, the tenor truly engages with the text on a minute level, and the results are compelling, even if the very end of the scene is just slightly over-emoted for my taste. I also feel that St John's two arias from La Resurrezione are a bit of an anticlimax after the dramatic intensity of all the opera extracts, though the thinner textures of the accompaniment encourage an even more introverted approach from Villazón, which is interesting to hear. The tenor is undoubtedly lucky to have collaborated with such outstanding musicians as the Gabrieli Players and Paul McCreesh, who know just how to strike the right balance between observing period performance practice and expressing the music as vividly as possible. Overall, Villazón has triumphed to a quite unexpected degree, and thereby paid tribute to Handel in his anniversary year in the best way possible. 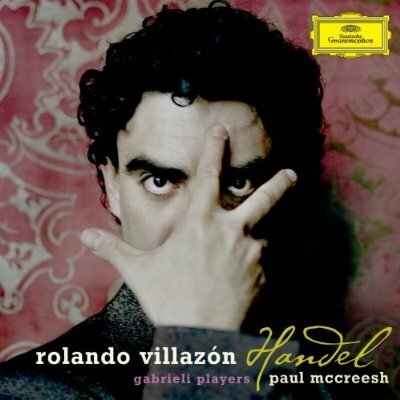 Rolando Villazon's Handel disc is released on 16 March 2009.